to provide treatment and training to the highest possible standards. Maria Mercati is the originator of the concept of combining Acupuncture and Tui Na for a unique and powerful therapy for the control of pain and the promotion and maintenance of good health. Maria Mercati is the most authoritative and innovative teacher in this field today and has been teaching and practising acupuncture and Tui Na Chinese Medical Massage and Manipulation in Cheltenham for over 25 years. Students come from all over the world to benefit from her individualized and highly effective training style. She has also treated thousands of patients. She is committed to furthering the educational standards of acupuncturists. In 1996 she was nominated for an award for her teaching of Chinese Medicine by the European Union of Women. Since 1992, she has studied acupuncture in China 14 times at TCM hospitals in Shanghai, Weihai, Beijing, Xian, Jinan and Hangzhou. 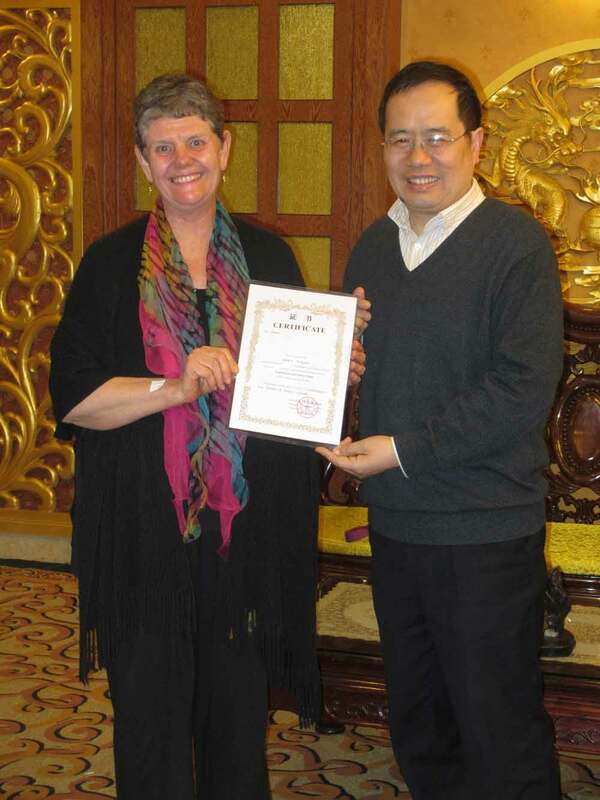 In 1993, she accompanied the Cheltenham Mayor – Jim Pennington to Weihai, Cheltenham’s twin town, on an official visit. Maria Mercati a leading teacher of Tui Na massage based in Cheltenham, England was nominated by the European Union of Women in 1996 for bringing Tui Na and acupuncture to the forefront in the UK. Those chosen receive the European Women of Achievement Award. The awards are given annually to three or four women in each European country. Previous recipients have mainly been from large companies, universities and the media. Maria is a best selling international author. Maria is the author of two Tui Na Chinese massage books and a Thai massage all of which are international bestsellers, which to date have sold over a third of a million copies and translated into several different languages. “Step-by-Step Tui Na” first published in 1997 and “Thai Massage” first published in 1998 are definitive texts, “Tui Na for a Healthy Brighter Child” was published in 1998 and “Hands on Health” published by Readers Digest 1998. Her Revised Thai Massage Manual was republished in 2017 and her revised Tui Na manual will be available mid June 2018. – Watch this space for her definitive acupuncture book! She has produced and directed a series of professionally filmed DVD’s to accompany her books. She has left a legacy of books, DVD’s, students, and a body of knowledge that will change therapy, and the study of Traditional Chinese Medicine forever. Even today, Maria’s Tui Na and Thai books and DVD’s form the basis and foundations of her competitor’s training courses. Maria has been interviewed by a variety of magazines from Tatler to Top Sante. Most major newspapers, have interviewed her over the past 25+ years. She saw the potential of drawing from three of the world’s most ancient, powerful and alternative medicine and complementary therapies – Traditional Chinese Medicine – Tui Na and Acupuncture, Thai and Indonesian soft tissue massage and joint manipulations to create the concept of Bodyharmonics. Her speciality is in combining her unique Acupuncture treatments with Tui Na to create some of the most powerful medicine in the world today. Maria’s method is unique. The methods she uses and teaches have been developed from her many periods of study in China, Indonesia and Thailand working with the leading experts in their respective fields. She furthered her knowledge and refined her techniques under several prominent Chinese doctors at the famous Yue-Yang hospital in Shanghai in 1992 and hospitals in Weihai, Xian, Jinan and Hangzhou. In Thailand she studied at the sacred Wat Pho temple in Bangkok and at the massage hospital in Chiang Mai. Indonesian massage became part of her life during her four year period in Bandung from 1979, where she was taught massage by traditional experts. She brings a wealth of practical experience to her courses, having achieved outstanding results with thousands of patients. Maria trained the rest of the family and they all became involved, on a professional basis. The family massages each other; often at the end of the working day. Maria was the first person to develop a system of integrated bodywork based on Chinese, Thai and Indonesian massage and manipulation and created the phrase “ORIENTAL BODYWORK ” in 1995.